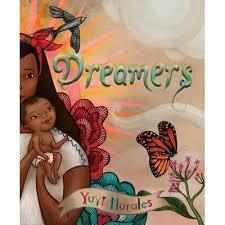 Our Cover to Cover Book of the Month for November is Dreamers by Yuyi Morales. This beautifully illustrated book will take you on an inspirational journey of the courage and hope it takes to follow your DREAMS! Dreamers is full of beautiful illustrations. Take a picture walk trough the book! Try using the question, “What is going on here?” to start a conversation with your child. Each page of this book can spark a wonderful conversation! Utilizing this method allows you to tune into your child, allowing them to guide the conversation around the illustrations that spark their interest. Encourage imagination, creativity, and problem solving skills by role playing with your child! Use stuffed animals or dolls to act out different scenarios that are scary or intimidating. Have fun, but also don’t be afraid to act out scenarios that may require extra courage! Send a picture of you and your child role playing together!